There are a few away-from-the-horn exercises that brass players have developed over the years to augment practice, such as free buzzing, the P.E.T.E., and the pencil trick exercise. You might think of these exercises as being analogous to weight training for your chops. They are an effective way to strengthen specific embouchure muscles away from the horn in such a way that you don’t risk the injury that can come from excessive mouthpiece pressure. They are also strenuous, when done correctly, so they really work the muscles when done properly. A standard, unsharpened wooden pencil is generally used for this routine. Form your saturated embouchure as if to buzz and place the tip of either end of the pencil between your compressed lips – NOT BETWEEN YOUR TEETH. While pointing the pencil in a forward, horizontal manner, strive to support it with only the “pinching power” of your lips. Do not become discouraged if the pencil falls to the floor. In practically all cases a great deal of perseverance is required. As soon as sufficient pinching power of the embouchure formation has been achieved, the prescribed drill will no longer present a problem. Initially, do not attempt the embouchure pencil support for more than a few seconds at a time – it is extremely strenuous. After each attempt has been completed, remove the pencil from between your lips, drop your jaw, open your mouth, exhale and relax. You will feel the results of your workout throughout the lower part of your facial area; this is correct. The amount of time consumed for each workout may be extended; however, it is vital that you accomplish this by degrees. Donald S. Reinhardt, Encyclopedia of the Pivot System, Appendix 4-5. One thing that most people seem to miss when trying this exercise out is that you should set the pencil between your lips while forming your lips (and jaw) as if you were buzzing or playing. If you bunch up your chin or set your jaw in a different position, you’re not targeting the muscles you want to be and the exercise itself is too easy. To the left I am forming my embouchure as if I’m getting ready to play. Note the position of my jaw. My chin is held taunt and my mouth corners are locked in place as if I was buzzing. Thoroughly wetting your lips will make them more slippery and further enhance the challenge of this exercise. Once you have set your lips with buzzing firmness, try to maintain this embouchure formation while holding the pencil between the lips, taking care to not use your teeth to help support it. It’s alright if the pencil drops a bit less than horizontal, as long as you’re maintaining the proper embouchure formation while doing this. Again, many players when first trying this routine out will disengage the chin from the jaw or hold their jaw in a position that is too different from how they buzz. This results in the muscles of the chin bunching up and holding the pencil and makes this exercise too easy to have any practical benefit. 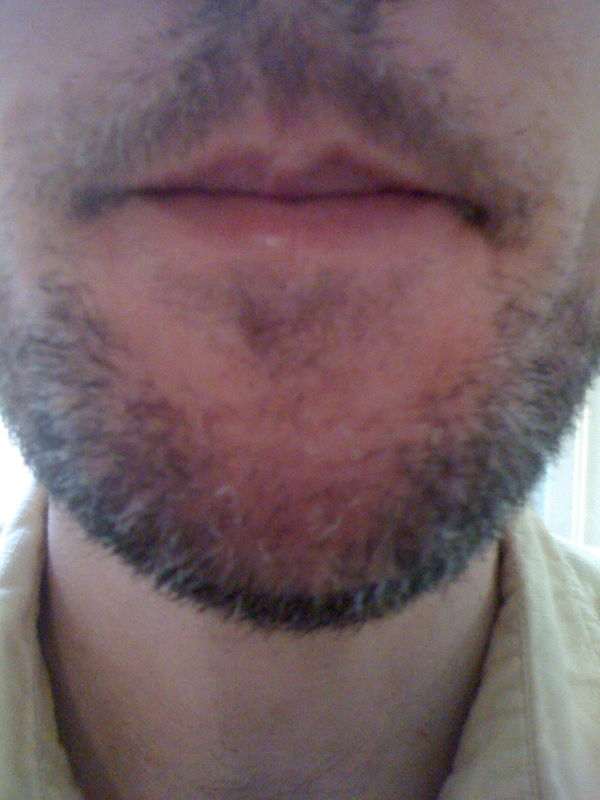 Take a look at my chin in the following photo and note the difference from the correct position in the photos above. 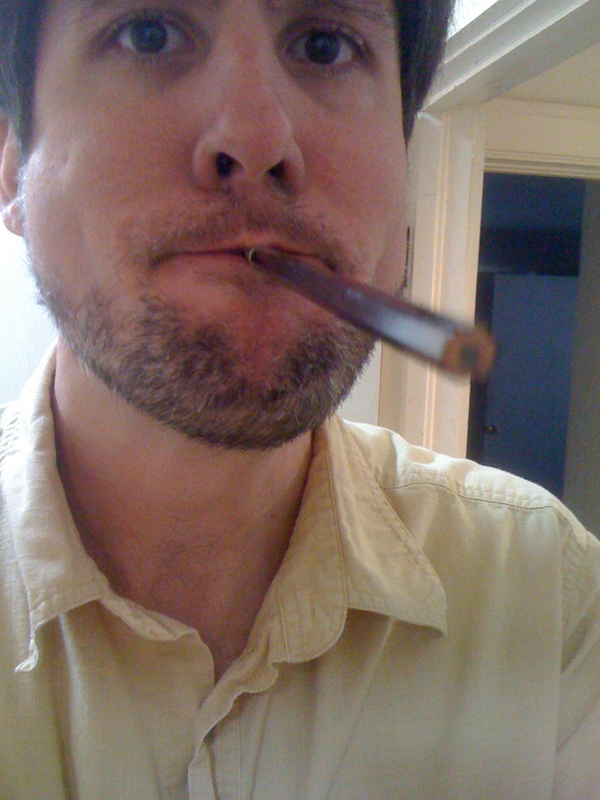 Since I have a beard, you can’t really get a good look at the characteristic “peach pit” look of my chin in the photo to the left, but you definitely want to avoid this look when both playing and doing the pencil trick exercise. I can hold the pencil like this for a long period of time with this incorrect formation, but it doesn’t target the muscles that I want to strengthen. Holding the pencil with the correct embouchure formation is a struggle. Actually playing with your chin disengaged from your jaw like this correlates with some problems. 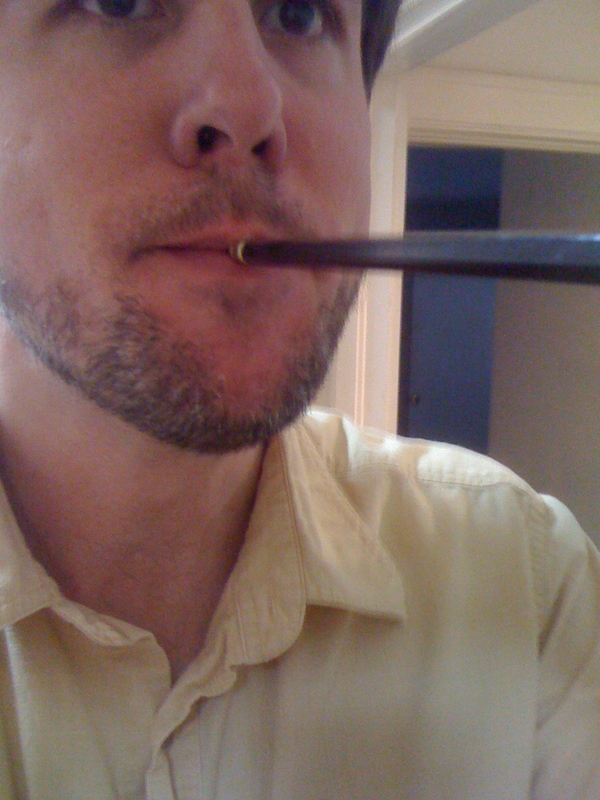 For a different look, compare the look of my chin and jaw doing the pencil trick exercise from the side. In closing, I’d like to reiterate that a little goes a long way with this exercise as it is quite strenuous. 30 seconds or so a day is probably enough, at least at first. If you’re really having trouble with it you can “cheat” a bit by holding the pencil with your hand a bit, but think of this sort of like spotting yourself while lifting weights. You want to do as much of the work as possible with the embouchure muscles and your goal is proper form over length of time holding the pencil out. Finally, it’s tempting for a lot of people to do this exercise in the car. I recommend against this for two main reasons. First, is distracting you from your driving (quit talking on the phone while you’re at it). Secondly, think about what would happen if the air bag went off while you had a pencil between your lips. For the short amount of time it takes to derive good benefit from this exercise it hardly seems worth the risk. Hi, Dave. I’ve been curious about the pencil trick for a little while, but I’ve never been able to successfully perform it the way you describe here. For me, to have the muscles of the face contracted while at the same time maintaining a flat chin requires me to roll the bottom lip over the bottom teeth and/or jut out my lower jaw. When I do that, I either have very little bottom lip under the pencil (making it impossible to support it), or I have to place the pencil a little further inside my embouchure formation, in which case the bottom teeth are doing a fair amount of the work in supporting the pencil. When you do the pencil trick with correct form, as pictured above, is the rubber of the eraser touching your bottom teeth (not literally, but felt through your lip tissue)? How do you place the end of the pencil, relative to the teeth and lips? Hmm, I’d have to look at you doing this to know for certain. It sounds like you’re describing that the pencil eraser is in contact the the front of your lower teeth, which makes me wonder if you need to open your mouth a bit more so that the “aperture” (as if you were buzzing) would be above the lower teeth. It’s probably OK to roll your lower lip over your lower teeth at first, and I jut my jaw forward more when doing this exercise than I do while playing too. It might be OK to use a pencil sharpened down to half way for a while and gradually build it up to an unsharpened pencil (too bad you can unsharp a pencil!). Or you can check out the “Chopsticks” thing, which is essentially a set of different sized/weighted rods that do the same thing as different sized pencils. I’d send Doug E. or Dave S. a private message or email about this. Either one of those guys would be able to point you further in the right direction. 1. I place my teeth together, place the nub of the eraser against the teeth, and then close my lips around the pencil. 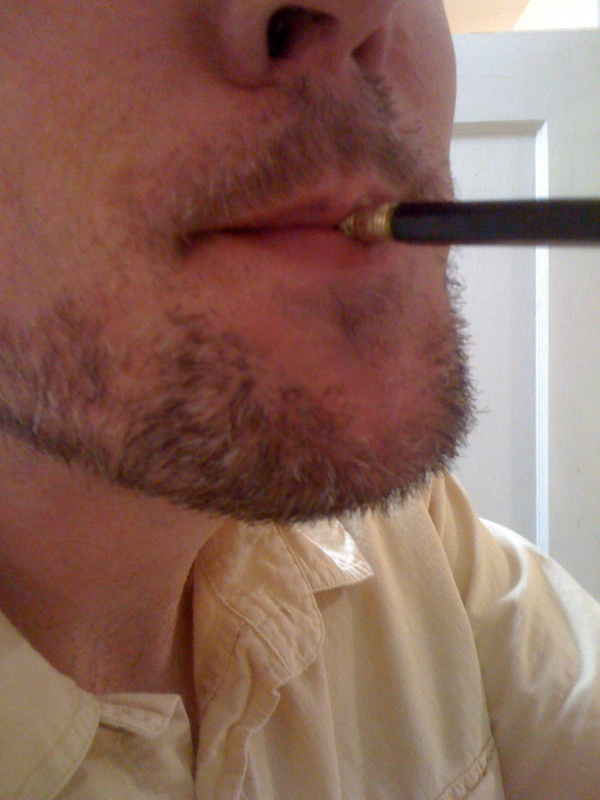 In this position, I cannot support the pencil without “bunching up” my chin. But it feels like I’m getting a good workout when I do, and in the right places, even though my chin is bunching up. 2. I open my jaw a little wider and roll my lower lip over my lower teeth, as I would when playing. In this case the nub of the eraser is against the upper teeth, but the lower teeth are underneath the end of the pencil. 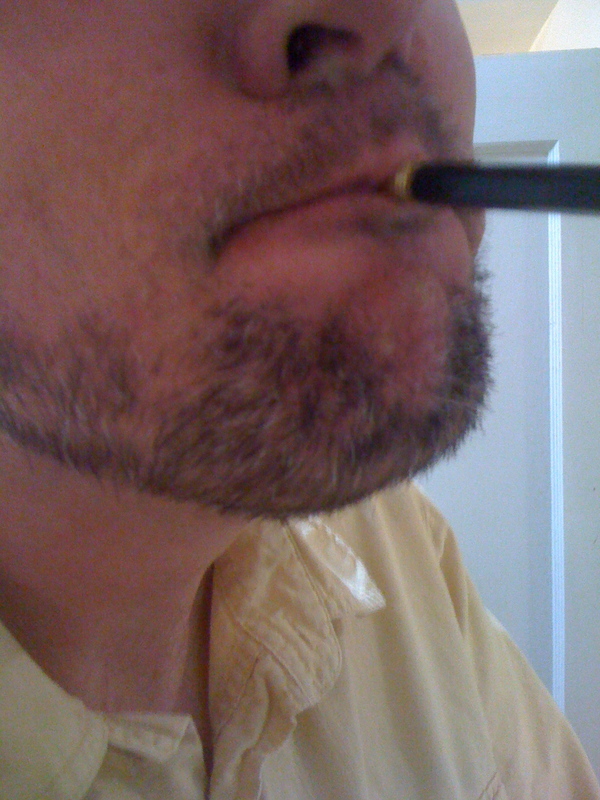 In this position, I can support the pencil with a flat chin very easily–it feels like the jaw is supporting the pencil more than my “chops”. I do start to feel fatigue below my mouth corners eventually, but not as quickly as in the first case (chin bunched up, but no support from lower teeth/jaw). In any case, I’m not sure if there’s any benefit to be had from this exercise that I don’t get from buzzing and the PETE. What do you think? I use a wooden chopstick instead of a pencil. I feel that the small rounded end helps me to focus more towards the vibrating points. It also keeps the embouchure closer to the buzzing position. Hi I just gave the pencil exercise a go for the first time but I’m struggling to manage it at all and when I do I’m not sure I’m doing it right. The only way I can do it is by thrusting the jaw right out. My facial muscles do feel like they’re getting a workout but I can feel it mostly in my jaw and cheek muscles and not really the corners is this right? I don’t really understand how it can be achieved without the jaw. Tensing the corners alone doesn’t seem to allow any movement of the pencil at all. Hi, Rhodri. Without being able to watch you try it, I can’t say for sure. Where you describe feeling the workout sounds like it’s not the right area you want to target. The jaw may not be in the exact same place where you play, but be sure you’re not trying to clamp your lips together by pushing the jaw (or chin) up. Keep your chin flat and the corners firm. If you’re not able to get it working right, don’t worry about it. Instead, practice your instrument for a while. Try the pencil trick out after a week, or even months or a year later. It’s not essential for good brass technique, it’s just a tool to accompany regular practice. Sometimes players won’t get it right until after they’ve been playing a while. Hmm, I’d have to watch you play. It might be that you think you’re corners are firm enough, but perhaps they aren’t locked in the correct place or need to be firmer still. Maybe your jaw position isn’t optimal for your embouchure or perhaps you’re switching between different embouchure types or consistently playing on the wrong embouchure type for your facial anatomy. Or, maybe you just need to spend more time on the instrument before everything can settle down for you. A good private teacher that can watch you play in person is the best way to go. Good luck! Yeh I think it might be possible that I’ve got some serious flaws in my embouchure but I think it’s probably too soon to tell. I’ve only been playing for about 6 months having taken a 6 year break from playing (played for 3 years back then) after all. The only thing that concerns me a little bit is that I’ve been working a lot on improving my range for the last 3 months or so with no improvement at all, which is why I’ve decided to give the pencil thing a go. It may be too early to tell what’s going on with you at this point (depending on your practice routine and frequency, especially), but I’d recommend you see someone who might be able to give you some advice: what you’re describing could be normal but could also be the symptom of a playing problem. I’m a relatively advanced brass player (at least well past the beginner stage), and I’ve never been able to do the “pencil trick” without either using my jaw (as you describe) or bunching my chin. I suspect it may have something to do with the ratio of the lower lip to the lower teeth. Ok thanks for the help. I actually have a great teacher but my lessons are quite widespread and she’s also very busy so I try not to bother her with lots of questions in between lessons, instead doing research myself. I think I’m being far too impatient though I’ll get there. I am a high school trombone player who seeks for increasing my high range and endurance. I am a upstream embourchure player. While I’m trying to do this exercise, I find that there is no possible way for my lips to hold on to the pencil unless I bunch up my lips a little bit. However, after doing this exercise, the part where it’s under my lower lip and above my chin(which I believe is the targeted muscles if I didn’t mistaken) still feels tired and exhausted. I am wondering is it because I am an upstream player so the setting would be a little different, or is it just that I did the wrong thing. I’m not sure that being upstream or downstream will have much difference in using this exercise, Oscar. If you’re having trouble holding the pencil that probably means your form for the exercise is good. It’s OK to “spot” yourself a bit by holding the pencil horizontal a bit with your finger while doing it. Just concentrate on holding it by firming the mouth corners and not bunching the chin. Over time you should be able to hold the pencil straight with with lip compression alone. Thank you! I found this helpful. I was doing this wrong but i now believe i am using the correct technique. Really feeling it in the embouchure muscles now. I note that this is an old thread but is still acurrent issue that people have. I will be retrying this excersize again following on from your helpful illustrations. I think the most important thing to not is that you can initially support the weight until you get enough of the correct muscles working. Otherwise it would be the equivalent of attempting to lift 300k on your first ever trip to the gym. I am a 42 year old male trying trumpet for the first time. Without the years of previous playing experience needed, I would be expecting a lot of my lips to achieve the correct position without the required foundations.